This article covers the Greek civilization as a whole. For the history of the modern nation-state, see History of modern Greece. At its cultural and geographical peak, Greek civilization spread from Greece to Egypt and to the Hindu Kush mountains in Afghanistan. Since then, Greek minorities have remained in former Greek territories (e.g. Turkey, Albania, Italy, Libya, Levant, Armenia, Georgia) and Greek emigrants have assimilated into differing societies across the globe (e.g. North America, Australia, Northern Europe, South Africa). Nowadays most Greeks live in the modern states of Greece (independent since 1821) and Cyprus. Proto-Greek linguistic area according to linguist Vladimir I. Georgiev. The Neolithic Revolution reached Europe beginning in 7000–6500 BC when agriculturalists from the Near East entered the Greek peninsula from Anatolia by island-hopping through the Aegean Sea. The earliest Neolithic sites with developed agricultural economies in Europe dated 8500–9000 BPE are found in Greece. The first Greek-speaking tribes, speaking the predecessor of the Mycenaean language, arrived in the Greek mainland sometime in the Neolithic period or the Early Bronze Age (ca. 3200 BC). The transition from the Greek Neolithic to the Early Bronze Age (or Early Helladic I–II) occurred gradually when Greece's agricultural population began to import bronze and copper and used basic bronze-working techniques. During the end of the 3rd millennium BC (circa 2200 BC; Early Helladic III), the indigenous inhabitants of mainland Greece underwent a cultural transformation attributed to climate change, local events and developments (e.g., destruction of the "House of the Tiles"), as well as to continuous contacts with various areas such as western Asia Minor, the Cyclades, Albania and Dalmatia. The Cycladic culture is a significant Late Neolithic and Early Bronze Age culture, is best known for its schematic flat female idols carved out of the islands' pure white marble centuries before the great Middle Bronze Age ("Minoan") culture arose in Crete, to the south. The Minoan civilization in Crete, which lasted from about c. 3000 BC (Early Minoan) to c. 1400 BC, and the Helladic culture on the Greek mainland from circa 3200/3100 BC to 2000/1900 BC. Little specific information is known about the Minoans (even the name Minoans is a modern appellation, derived from Minos, the legendary king of Crete), including their written system, which was recorded on the undeciphered Linear A script and Cretan hieroglyphs. They were primarily a mercantile people engaged in extensive overseas trade throughout the Mediterranean region. Minoan civilization was affected by a number of natural cataclysms such as the volcanic eruption at Thera (c. 1628–1627 BC) and earthquakes (c. 1600 BC). In 1425 BC, the Minoan palaces (except Knossos) were devastated by fire, which allowed the Mycenaean Greeks, influenced by the Minoans' culture, to expand into Crete. The Minoan civilization which preceded the Mycenaean civilization on Crete was revealed to the modern world by Sir Arthur Evans in 1900, when he purchased and then began excavating a site at Knossos. Mycenaean Greece, ca. 1400–1100 BC. Mycenaean civilization originated and evolved from the society and culture of the Early and Middle Helladic periods in mainland Greece. It emerged in circa 1600 BC, when Helladic culture in mainland Greece was transformed under influences from Minoan Crete and lasted until the collapse of the Mycenaean palaces in c. 1100 BC. Mycenaean Greece is the Late Helladic Bronze Age civilization of Ancient Greece and it is the historical setting of the epics of Homer and most of Greek mythology and religion. The Mycenaean period takes its name from the archaeological site Mycenae in the northeastern Argolid, in the Peloponnesos of southern Greece. Athens, Pylos, Thebes, and Tiryns are also important Mycenaean sites. Mycenaean civilization was dominated by a warrior aristocracy. Around 1400 BC, the Mycenaeans extended their control to Crete, center of the Minoan civilization, and adopted a form of the Minoan script called Linear A to write their early form of Greek. The Mycenaean-era script is called Linear B, which was deciphered in 1952 by Michael Ventris. The Mycenaeans buried their nobles in beehive tombs (tholoi), large circular burial chambers with a high-vaulted roof and straight entry passage lined with stone. They often buried daggers or some other form of military equipment with the deceased. The nobility were often buried with gold masks, tiaras, armor and jeweled weapons. Mycenaeans were buried in a sitting position, and some of the nobility underwent mummification. 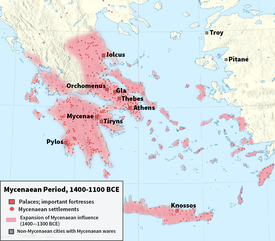 Around 1100–1050 BC, the Mycenaean civilization collapsed. Numerous cities were sacked and the region entered what historians see as a "dark age". During this period, Greece experienced a decline in population and literacy. The Greeks themselves have traditionally blamed this decline on an invasion by another wave of Greek people, the Dorians, although there is scant archaeological evidence for this view. 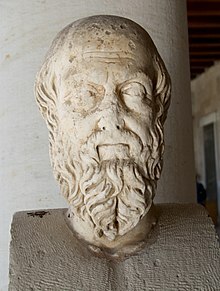 Ancient Greece refers to a period of Greek history that lasted from the Dark Ages to the end of antiquity (circa 600 AD). In common usage it refers to all Greek history before the Roman Empire, but historians use the term more precisely. Some writers include the periods of the Minoan and Mycenaean civilizations, while others argue that these civilizations were so different from later Greek cultures that they should be classed separately. Traditionally, the Ancient Greek period was taken to begin with the date of the first Olympic Games in 776 BC, but most historians now extend the term back to about 1000 BC. The traditional date for the end of the Classical Greek period is the death of Alexander the Great in 323 BC. The period that follows is classed as Hellenistic. Not everyone treats the Classical Greek and Hellenic periods as distinct; however, and some writers treat the Ancient Greek civilization as a continuum running until the advent of Christianity in the 3rd century AD. Ancient Greece is considered by most historians to be the foundational culture of Western civilization. Greek culture was a powerful influence in the Roman Empire, which carried a version of it to many parts of Europe. Ancient Greek civilization has been immensely influential on the language, politics, educational systems, philosophy, art and architecture of the modern world, particularly during the Renaissance in Western Europe and again during various neo-classical revivals in 18th and 19th-century Europe and the Americas. The Greek Dark Ages (ca. 1100 BC–800 BC) refers to the period of Greek history from the presumed Dorian invasion and end of the Mycenaean civilization in the 11th century BC to the rise of the first Greek city-states in the 9th century BC and the epics of Homer and earliest writings in alphabetic Greek in the 8th century BC. The collapse of the Mycenaean coincided with the fall of several other large empires in the near east, most notably the Hittite and the Egyptian. The cause may be attributed to an invasion of the Sea People wielding iron weapons. When the Dorians came down into Greece they also were equipped with superior iron weapons, easily dispersing the already weakened Mycenaeans. The period that follows these events is collectively known as the Greek Dark Ages. Kings ruled throughout this period until eventually they were replaced with an aristocracy, then still later, in some areas, an aristocracy within an aristocracy—an elite of the elite. Warfare shifted from a focus on cavalry to a great emphasis on infantry. Due to its cheapness of production and local availability, iron replaced bronze as the metal of choice in the manufacturing of tools and weapons. Slowly equality grew among the different sects of people, leading to the dethronement of the various Kings and the rise of the family. At the end of this period of stagnation, the Greek civilization was engulfed in a renaissance that spread the Greek world as far as the Black Sea and Spain. Writing was relearned from the Phoenicians, eventually spreading north into Italy and the Gauls. In the 8th century BC, Greece began to emerge from the Dark Ages which followed the fall of the Mycenaean civilization. Literacy had been lost and Mycenaean script forgotten, but the Greeks adopted the Phoenician alphabet, modifying it to create the Greek alphabet. From about the 9th century BC, written records begin to appear. Greece was divided into many small self-governing communities, a pattern largely dictated by Greek geography, where every island, valley and plain is cut off from its neighbours by the sea or mountain ranges. The Archaic period can be understood as the Orientalizing period, when Greece was at the fringe, but not under the sway, of the budding Neo-Assyrian Empire. Greece adopted significant amounts of cultural elements from the Orient, in art as well as in religion and mythology. Archaeologically, Archaic Greece is marked by Geometric pottery. The basic unit of politics in Ancient Greece was the polis, sometimes translated as city-state. "Politics" literally means "the things of the polis" where each city-state was independent, at least in theory. Some city-states might be subordinate to others (a colony traditionally deferred to its mother city), some might have had governments wholly dependent upon others (the Thirty Tyrants in Athens was imposed by Sparta following the Peloponnesian War), but the titularly supreme power in each city was located within that city. This meant that when Greece went to war (e.g., against the Persian Empire), it took the form of an alliance going to war. It also gave ample opportunity for wars within Greece between different cities. To prosecute the war and then to defend Greece from further Persian attack, Athens founded the Delian League in 477 BC. Initially, each city in the League would contribute ships and soldiers to a common army, but in time Athens allowed (and then compelled) the smaller cities to contribute funds so that it could supply their quota of ships. Secession from the League could be punished. Following military reversals against the Persians, the treasury was moved from Delos to Athens, further strengthening the latter's control over the League. The Delian League was eventually referred to pejoratively as the Athenian Empire. In 458 BC, while the Persian Wars were still ongoing, war broke out between the Delian League and the Peloponnesian League, comprising Sparta and its allies. After some inconclusive fighting, the two sides signed a peace in 447 BC. That peace was stipulated to last thirty years: instead it held only until 431 BC, with the onset of the Peloponnesian War. Our main sources concerning this war are Thucydides's History of the Peloponnesian War and Xenophon's Hellenica. The war began over a dispute between Corcyra and Epidamnus. Corinth intervened on the Epidamnian side. Fearful lest Corinth capture the Corcyran navy (second only to the Athenian in size), Athens intervened. It prevented Corinth from landing on Corcyra at the Battle of Sybota, laid siege to Potidaea, and forbade all commerce with Corinth's closely situated ally, Megara (the Megarian decree). There was disagreement among the Greeks as to which party violated the treaty between the Delian and Peloponnesian Leagues, as Athens was technically defending a new ally. The Corinthians turned to Sparta for aid. Fearing the growing might of Athens, and witnessing Athens' willingness to use it against the Megarians (the embargo would have ruined them), Sparta declared the treaty to have been violated and the Peloponnesian War began in earnest. The first stage of the war (known as the Archidamian War for the Spartan king, Archidamus II) lasted until 421 BC with the signing of the Peace of Nicias. The Athenian general Pericles recommended that his city fight a defensive war, avoiding battle against the superior land forces led by Sparta, and importing everything needful by maintaining its powerful navy. Athens would simply outlast Sparta, whose citizens feared to be out of their city for long lest the helots revolt. This strategy required that Athens endure regular sieges, and in 430 BC it was visited with an awful plague that killed about a quarter of its people, including Pericles. With Pericles gone, less conservative elements gained power in the city and Athens went on the offensive. It captured 300–400 Spartan hoplites at the Battle of Pylos. This represented a significant fraction of the Spartan fighting force which the latter decided it could not afford to lose. Meanwhile, Athens had suffered humiliating defeats at Delium and Amphipolis. The Peace of Nicias concluded with Sparta recovering its hostages and Athens recovering the city of Amphipolis. Map of the Delian League ("Athenian Empire") in 431 BC, just prior to the Peloponnesian War. Those who signed the Peace of Nicias in 421 BC swore to uphold it for fifty years. The second stage of the Peloponnesian War began in 415 BC when Athens embarked on the Sicilian Expedition to support an ally (Segesta) attacked by Syracuse and to conquer Sicily. 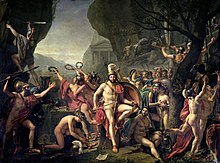 Initially, Sparta was reluctant, but Alcibiades, the Athenian general who had argued for the Sicilian Expedition, defected to the Spartan cause upon being accused of grossly impious acts and convinced them that they could not allow Athens to subjugate Syracuse. The campaign ended in disaster for the Athenians. Athens' Ionian possessions rebelled with the support of Sparta, as advised by Alcibiades. In 411 BC, an oligarchical revolt in Athens held out the chance for peace, but the Athenian navy, which remained committed to the democracy, refused to accept the change and continued fighting in Athens' name. The navy recalled Alcibiades (who had been forced to abandon the Spartan cause after reputedly seducing the wife of Agis II, a Spartan king) and made him its head. The oligarchy in Athens collapsed and Alcibiades reconquered what had been lost. In 407 BC, Alcibiades was replaced following a minor naval defeat at the Battle of Notium. The Spartan general Lysander, having fortified his city's naval power, won victory after victory. Following the Battle of Arginusae, which Athens won but was prevented by bad weather from rescuing some of its sailors, Athens executed or exiled eight of its top naval commanders. Lysander followed with a crushing blow at the Battle of Aegospotami in 405 BC which almost destroyed the Athenian fleet. Athens surrendered one year later, ending the Peloponnesian War. The war had left devastation in its wake. Discontent with the Spartan hegemony that followed (including the fact that it ceded Ionia and Cyprus to the Persian Empire at the conclusion of the Corinthian War (395–387 BC); see Treaty of Antalcidas) induced the Thebans to attack. Their general, Epaminondas, crushed Sparta at the Battle of Leuctra in 371 BC, inaugurating a period of Theban dominance in Greece. In 346 BC, unable to prevail in its ten-year war with Phocis, Thebes called upon Philip II of Macedon for aid. Macedon quickly forced the city states into being united by the League of Corinth which led to the conquering of the Persian Empire and the Hellenistic Age had begun. Coin showing Demetrius I Poliorcetes. The Hellenistic period of Greek history begins with the death of Alexander the Great in 323 BC and ends with the annexation of the Greek peninsula and islands by Rome in 146 BC. Although the establishment of Roman rule did not break the continuity of Hellenistic society and culture, which remained essentially unchanged until the advent of Christianity, it did mark the end of Greek political independence. Athens and her allies revolted against Macedon upon hearing that Alexander had died, but were defeated within a year in the Lamian War. Meanwhile, a struggle for power broke out among Alexander's generals, which resulted in the break-up of his empire and the establishment of a number of new kingdoms (see the Wars of the Diadochi). Ptolemy was left with Egypt, Seleucus with the Levant, Mesopotamia, and points east. Control of Greece, Thrace, and Anatolia was contested, but by 298 BC the Antigonid dynasty had supplanted the Antipatrid. Macedonian control of the city-states was intermittent, with a number of revolts. Athens, Rhodes, Pergamum and other Greek states retained substantial independence, and joined the Aetolian League as a means of defending it and restoring democracy in their states, whereas they saw Macedon as a tyrannical kingdom because of the fact they had not adopted democracy. The Achaean League, while nominally subject to the Ptolemies was in effect independent, and controlled most of southern Greece. Sparta also remained independent, but generally refused to join any league. In 267 BC, Ptolemy II persuaded the Greek cities to revolt against Macedon, in what became the Chremonidean War, after the Athenian leader Chremonides. The cities were defeated and Athens lost her independence and her democratic institutions. This marked the end of Athens as a political actor, although it remained the largest, wealthiest and most cultivated city in Greece. 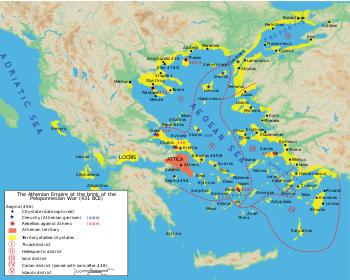 In 225 BC, Macedon defeated the Egyptian fleet at Cos and brought the Aegean islands, except Rhodes, under its rule as well. Sparta remained hostile to the Achaeans, and in 227 BC invaded Achaea and seized control of the League. The remaining Achaeans preferred distant Macedon to nearby Sparta, and allied with the former. In 222 BC, the Macedonian army defeated the Spartans and annexed their city—the first time Sparta had ever been occupied by a different state. Philip V of Macedon was the last Greek ruler with both the talent and the opportunity to unite Greece and preserve its independence against the ever-increasing power of Rome. Under his auspices, the Peace of Naupactus (217 BC) brought conflict between Macedon and the Greek leagues to an end, and at this time he controlled all of Greece except Athens, Rhodes and Pergamum. In 215 BC, however, Philip formed an alliance with Rome's enemy Carthage. Rome promptly lured the Achaean cities away from their nominal loyalty to Philip, and formed alliances with Rhodes and Pergamum, now the strongest power in Asia Minor. The First Macedonian War broke out in 212 BC, and ended inconclusively in 205 BC, but Macedon was now marked as an enemy of Rome. In 202 BC, Rome defeated Carthage, and was free to turn her attention eastwards. In 198 BC, the Second Macedonian War broke out because Rome saw Macedon as a potential ally of the Seleucid Empire, the greatest power in the east. Philip's allies in Greece deserted him and in 197 BC he was decisively defeated at the Battle of Cynoscephalae by the Roman proconsul Titus Quinctius Flaminius. Luckily for the Greeks, Flaminius was a moderate man and an admirer of Greek culture. Philip had to surrender his fleet and become a Roman ally, but was otherwise spared. At the Isthmian Games in 196 BC, Flaminius declared all the Greek cities free, although Roman garrisons were placed at Corinth and Chalcis. But the freedom promised by Rome was an illusion. All the cities except Rhodes were enrolled in a new League which Rome ultimately controlled, and aristocratic constitutions were favoured and actively promoted. Militarily, Greece itself declined to the point that the Romans conquered the land (168 BC onwards), though Greek culture would in turn conquer Roman life. Although the period of Roman rule in Greece is conventionally dated as starting from the sacking of Corinth by the Roman Lucius Mummius in 146 BC, Macedonia had already come under Roman control with the defeat of its king, Perseus, by the Roman Aemilius Paullus at Pydna in 168 BC. The Romans divided the region into four smaller republics, and in 146 BC Macedonia officially became a province, with its capital at Thessalonica. The rest of the Greek city-states gradually and eventually paid homage to Rome ending their de jure autonomy as well. The Romans left local administration to the Greeks without making any attempt to abolish traditional political patterns. The agora in Athens continued to be the centre of civic and political life. Caracalla's decree in 212 AD, the Constitutio Antoniniana, extended citizenship outside Italy to all free adult men in the entire Roman Empire, effectively raising provincial populations to equal status with the city of Rome itself. The importance of this decree is historical, not political. It set the basis for integration where the economic and judicial mechanisms of the state could be applied throughout the Mediterranean as was once done from Latium into all Italy. In practice of course, integration did not take place uniformly. Societies already integrated with Rome, such as Greece, were favored by this decree, in comparison with those far away, too poor or just too alien such as Britain, Palestine or Egypt. Caracalla's decree did not set in motion the processes that led to the transfer of power from Italy and the West to Greece and the East, but rather accelerated them, setting the foundations for the millennium-long rise of Greece, in the form of the Eastern Roman Empire, as a major power in Europe and the Mediterranean in the Middle Ages. Depiction of the Greek fire by John Skylitzes' Chronicle (late 11th century). The history of the East Roman or Byzantine Empire is described by Byzantinist August Heisenberg as the history of "the Christianized Roman empire of the Greek nation". The division of the empire into East and West and the subsequent collapse of the Western Roman Empire were developments that constantly accentuated the position of the Greeks in the empire and eventually allowed them to become identified with it altogether. The leading role of Constantinople began when Constantine the Great turned Byzantium into the new capital of the Roman Empire, from then on to be known as Constantinople, placing the city at the center of Hellenism, a beacon for the Greeks that lasted to the modern era. The figures of Constantine the Great and Justinian dominated during 324–610. Assimilating the Roman tradition, the emperors sought to offer the basis for later developments and for the formation of the Byzantine Empire. Efforts to secure the borders of the Empire and to restore the Roman territories marked the early centuries. At the same time, the definitive formation and establishment of the Orthodox doctrine, but also a series of conflicts resulting from heresies that developed within the boundaries of the empire, marked the early period of Byzantine history. In the first period of the middle Byzantine era (610–867), the empire was attacked both by old enemies (Persians, Lombards, Avars and Slavs) as well as by new ones, appearing for the first time in history (Arabs, Bulgars). The main characteristic of this period was that the enemy attacks were not localized to the border areas of the state but they were extended deep beyond, even threatening the capital itself. The attacks of the Slavs lost their periodical and temporary character and became permanent settlements that transformed into new states, initially hostile to Constantinople until their christianization. Those states were referred by the Byzantines as Sclavinias. Changes were also observed in the internal structure of the empire which was dictated by both external and internal conditions. The predominance of the small free farmers, the expansion of the military estates and the development of the system of themes, brought to completion developments that had started in the previous period. Changes were noted also in the sector of administration: the administration and society had become immiscibly Greek, while the restoration of Orthodoxy after the iconoclast movement, allowed the successful resumption of missionary action among neighboring peoples and their placement within the sphere of Byzantine cultural influence. During this period the state was geographically reduced and economically damaged, since it lost wealth-producing regions; however, it obtained greater lingual, dogmatic and cultural homogeneity. From the late 8th century, the Empire began to recover from the devastating impact of successive invasions, and the reconquest of Greek peninsula began. Greeks from Sicily and Asia Minor were brought in as settlers. The Slavs were either driven out to Asia Minor or assimilated and the Sclavinias were eliminated. By the middle of the 9th century, Greece was Byzantine again, and the cities began to recover due to improved security and the restoration of effective central control. When the Byzantine Empire was rescued from a period of crisis by the resolute leadership of the three Komnenoi emperors Alexios, John and Manuel in the 12th century, Greece prospered. Recent research has revealed that this period was a time of significant growth in the rural economy, with rising population levels and extensive tracts of new agricultural land being brought into production. The widespread construction of new rural churches is a strong indication that prosperity was being generated even in remote areas. A steady increase in population led to a higher population density, and there is good evidence that the demographic increase was accompanied by the revival of towns. According to Alan Harvey's Economic Expansion in the Byzantine Empire 900–1200, towns expanded significantly in the twelfth century. Archaeological evidence shows an increase in the size of urban settlements, together with a ‘notable upsurge’ in new towns. Archaeological evidence tells us that many of the medieval towns, including Athens, Thessaloniki, Thebes and Corinth, experienced a period of rapid and sustained growth, starting in the 11th century and continuing until the end of the 12th century. The growth of the towns attracted the Venetians, and this interest in trade appears to have further increased economic prosperity in Greece. Certainly, the Venetians and others were active traders in the ports of the Holy Land, and they made a living out of shipping goods between the Crusader Kingdoms of Outremer and the West while also trading extensively with Byzantium and Egypt. A kind of "Renaissance" of the Byzantine art, as described by scholars, began since the 10th century. 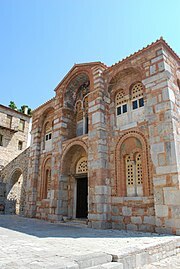 Many of the most important Byzantine churches in and around Athens, for example, were built during these two centuries, and this reflects the growth of urbanisation in Greece during this period. There was also a revival in the mosaic art with artists showing great interest in depicting natural landscapes with wild animals and scenes from the hunt. Mosaics became more realistic and vivid, with an increased emphasis on depicting three-dimensional forms. With its love of luxury and passion for color, the art of this age delighted in the production of masterpieces that spread the fame of Byzantium throughout the Christian world. Beautiful silks from the workshops of Constantinople also portrayed in dazzling color animals—lions, elephants, eagles, and griffins—confronting each other, or representing Emperors gorgeously arrayed on horseback or engaged in the chase. The eyes of many patrons were attracted and the economy of Greece grew. In the provinces, regional schools of Architecture began producing many distinctive styles that drew on a range of cultural influences. All this suggests that there was an increased demand for art, with more people having access to the necessary wealth to commission and pay for such work. Yet the marvelous expansion of Byzantine art during this period, one of the most remarkable facts in the history of the empire, did not stop there. From the 10th to the 12th century, Byzantium was the main source of inspiration for the West. By their style, arrangement, and iconography the mosaics of St. Mark's at Venice and of the cathedral at Torcello clearly show their Byzantine origin. Similarly those of the Palatine Chapel, the Martorana at Palermo, and the cathedral of Cefalu, together with the vast decoration of the cathedral at Monreale, prove the influence of Byzantium οn the Norman Court of Sicily in the 12th century. Hispano-Moorish art was unquestionably derived from the Byzantine. Romanesque art owes much to the East, from which it borrowed not only its decorative forms but the plan of some of its buildings, as is proved, for instance, by the domed churches of south-western France. Princes of Kiev, Venetian doges, abbots of Monte Cassino, merchants of Amalfi, and the Norman kings of Sicily all looked to Byzantium for artists or works of art. Such was the influence of Byzantine art in the 12th century, that Russia, Venice, southern Italy and Sicily all virtually became provincial centers dedicated to its production. The division of the Byzantine Empire after the Fourth Crusade. 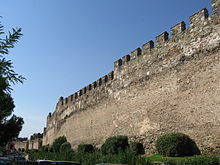 The year 1204 marks the beginning of the Late Byzantine period when Constantinople and a number of Byzantine territories were conquered by the Latins during the Fourth Crusade. 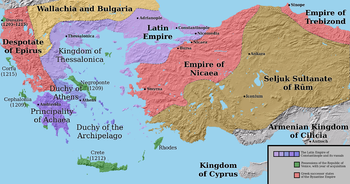 During this period, a number of Byzantine Greek successor states emerged such as the Empire of Nicaea, the Despotate of Epirus and the Empire of Trebizond. In Latin-occupied territories, elements of feudality entered medieval Greek life. The Latin Empire, however, lasted only 57 years when in 1261, Constantinople was reclaimed by the Byzantine Greeks and the Byzantine Empire was restored. From 1261 onwards, Byzantium underwent a gradual weakening of its internal structures and the reduction of its territories from Ottoman invasions culminating in the fall of Constantinople on May 29, 1453. The Ottoman conquest of Constantinople resulted in the official end of both Byzantium and the Byzantine period of Greek history. When the Ottomans arrived, two Greek migrations occurred. The first migration entailed the Greek intelligentsia migrating to Western Europe and influencing the advent of the Renaissance. The second migration entailed Greeks leaving the plains of the Greek peninsula and resettling in the mountains. The millet system contributed to the ethnic cohesion of Orthodox Greeks by segregating the various peoples within the Ottoman Empire based on religion. The Greeks living in the plains during Ottoman rule were either Christians who dealt with the burdens of foreign rule or Crypto-Christians (Greek Muslims who were secret practitioners of the Greek Orthodox faith). Some Greeks became Crypto-Christians to avoid heavy taxes and at the same time express their identity by maintaining their ties to the Greek Orthodox Church. However, Greeks who converted to Islam and were not Crypto-Christians were deemed "Turks" in the eyes of Orthodox Greeks, even if they didn't adopt the Turkish language. The Ottomans ruled Greece until the early 19th century. In the early months of 1821, the Greeks declared their independence but did not achieve it until 1829. The Great Powers first shared the same view concerning the necessity of preserving the status quo of the Ottoman Empire, but soon changed their stance. Scores of non-Greeks volunteered to fight for the cause, including Lord Byron. On October 20, 1827, a combined British, French and Russian naval force destroyed the Ottoman and Egyptian armada. The Russian minister of foreign affairs, Ioannis Kapodistrias, himself a Greek, returned home as President of the new Republic. The first capital of the independent Greece was Aigina (1828–1829) and the second was Nafplio (1828–1834). 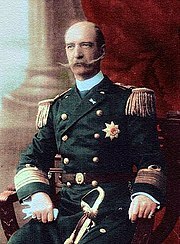 After his assassination, the European powers helped turn Greece into a monarchy; the first King, Otto, came from Bavaria and the second, George I, from Denmark. In 1834, King Otto transferred the capital to Athens. During the 19th and early 20th centuries, Greece sought to enlarge its boundaries to include the ethnic Greek population of the Ottoman Empire. Greece played a peripheral role in the Crimean War. When Russia attacked the Ottoman Empire in 1853, Greek leaders saw an opportunity to expand North and South into Ottoman areas that had a Christian majority. However, Greece did not coordinate its plans with Russia, did not declare war, and received no outside military or financial support. The French and British seized its major port and effectively neutralized the Greek army. Greek efforts to cause insurrections failed as they were easily crushed by Ottoman forces. Greece was not invited to the peace conference and made no gains out of the war. The frustrated Greek leadership blamed the King for failing to take advantage of the situation; his popularity plunged and he was later forced to abdicate. The Ionian Islands were given by Britain upon the arrival of the new King George I in 1863 and Thessaly was ceded by the Ottomans in 1880. In the late 19th century, modernization transformed the social structure of Greece. The population grew rapidly, putting heavy pressure on the system of small farms with low productivity. Overall, population density more than doubled from 41 persons per square mile in 1829 to 114 in 1912 (16 to 44 per km2). One response was emigration to the United States, with a quarter million people leaving between 1906 and 1914. Entrepreneurs found numerous business opportunities in the retail and restaurant sectors of American cities; some sent money back to their families, others returned with hundreds of dollars, enough to purchase a farm or a small business in the old village. The urban population tripled from 8% in 1853 to 24% in 1907. Athens grew from a village of 6000 people in 1834, when it became the capital, to 63,000 in 1879, 111,000 in 1896, and 167,000 in 1907. In Athens and other cities, men arriving from rural areas set up workshops and stores, creating a middle class. They joined with bankers, professional men, university students, and military officers, to demand reform and modernization of the political and economic system. Athens became the center of the merchant marine, which quadrupled from 250,000 tons in 1875 to more than 1,000,000 tons in 1915. As the cities modernized, businessmen adopted the latest styles of Western European architecture. The participation of Greece in the Balkan Wars of 1912–1913 is one of the most important episodes in modern Greek history, as it allowed the Greek state to almost double its size and achieve most of its present territorial size. As a result of the Balkan Wars of 1912–1913, most of Epirus, southern Macedonia, Crete and the northern Aegean islands were incorporated into the Kingdom of Greece. A map of Greater Greece after the Treaty of Sèvres, when the Megali Idea seemed close to fulfillment, featuring Eleftherios Venizelos. Greek cavalry attacking during the Greco-Turkish War (1919–1922). The outbreak of World War I in 1914 produced a split in Greek politics, with King Constantine I, an admirer of Germany, calling for neutrality while Prime Minister Eleftherios Venizelos pushed for Greece to join the Allies. The conflict between the monarchists and the Venizelists sometimes resulted in open warfare and became known as the National Schism. In 1916, the Allies forced Constantine to abdicate in favor of his son Alexander and Venizelos returned as premier. At the end of the war, the Great Powers agreed that the Ottoman city of Smyrna (Izmir) and its hinterland, both of which had large Greek populations, be handed over to Greece. Greek troops occupied Smyrna in 1919, and in 1920 the Treaty of Sèvres was signed by the Ottoman government; the treaty stipulated that in five years time a plebiscite would be held in Smyrna on whether the region would join Greece. However, Turkish nationalists, led by Mustafa Kemal Atatürk, overthrew the Ottoman government and organised a military campaign against the Greek troops, resulting in the Greco-Turkish War (1919-1922). A major Greek offensive ground to a halt in 1921, and by 1922 Greek troops were in retreat. The Turkish forces recaptured Smyrna on 9 September 1922, and setting the city ablaze and killing many Greeks and Armenians. The war was concluded by the Treaty of Lausanne (1923), according to which there was to be a population exchange between Greece and Turkey on the basis of religion. Over one million Orthodox Christians left Turkey in exchange for 400,000 Muslims from Greece. The events of 1919–1922 are regarded in Greece as a particularly calamitous period of history. Between 1914 and 1923, an estimated 750,000 to 900,000 Greeks died at the hands of the Ottoman Turks, in what many scholars have termed a genocide. Despite the country's numerically small and ill-equipped armed forces, Greece made a decisive contribution to the Allied efforts in World War II. At the start of the war, Greece sided with the Allies and refused to give in to Italian demands. Italy invaded Greece by way of Albania on 28 October 1940, but Greek troops repelled the invaders after a bitter struggle (see Greco-Italian War). This marked the first Allied victory in the war. Primarily to secure his strategic southern flank, German dictator Adolf Hitler reluctantly stepped in and launched the Battle of Greece in April 1941. Axis units from Germany, Bulgaria, and Italy successfully invaded Greece, through Yugoslavia, forcing out the Greek defenders. The Greek government eventually decided to stop the fighting and thus stopped sending ammunition and supplies to the northern front and the defenders were easily overrun. The Greek government then proceeded, as the Nazi forces came towards the capital of Athens, to leave for Crete and then Cairo. On 20 May 1941, the Germans attempted to seize Crete with a large attack by paratroopers, with the aim of reducing the threat of a counter-offensive by Allied forces in Egypt, but faced heavy resistance. The Greek campaign might have delayed German military plans against Soviet Union, and it is argued that had the German invasion of the Soviet Union started on 20 May 1941 instead of 22 June 1941, the Nazi assault against the Soviet Union might have succeeded. The heavy losses of German paratroopers led the Germans to launch no further large-scale air-invasions. During the Axis occupation of Greece, thousands of Greeks died in direct combat, in concentration camps, or of starvation. The occupiers murdered the greater part of the Jewish community despite efforts by Christian Greeks to shelter the Jews. The economy of Greece was devastated. When the Soviet Army began its drive across Romania in August 1944, the German Army in Greece began withdrawing north and northwestward from Greece into Yugoslavia and Albania to avoid being cut off in Greece. Hence, the German occupation of Greece ended in October 1944. The Resistance group ELAS seized control of Athens on 12 October 1944. British troops had already landed on 4 October in Patras, and entered Athens on 14 October 1944. "Between 1941 in 1945, over 8% of the Greek population had died; some 2000 villages and small towns had been razed to the ground; starvation was widespread due to the destruction of crops and worsened in many parts of Greece after liberation when agricultural labourers migrated to urban centres to escape politically inspired violence in the countryside; trade either internally or externally had all but ceased; most of Greece’s merchant marine lay at the bottom of the sea; and motorized transport had been confiscated by the axis occupiers." Organization and military bases of the Communist led "Democratic Army", as well as entry routes to Greece. The Greek Civil War (Greek: Eμφύλιος πόλεμος, translit. Emfílios pólemos) was the first major confrontation of the Cold War. It was fought between 1944 and 1949 in Greece between the nationalist/non-Marxist forces of Greece (financially supported by Great Britain at first, and later by the United States) and the Democratic Army of Greece (ELAS), which was the military branch of the Communist Party of Greece (KKE). The conflict resulted in a victory for the British — and later U.S.-supported government forces, which led to Greece receiving American funds through the Truman Doctrine and the Marshall Plan, as well as becoming a member of NATO, which helped to define the ideological balance of power in the Aegean for the entire Cold War. The first phase of the civil war occurred in 1942–1944. Marxist and non-Marxist resistance groups fought each other in a fratricidal conflict to establish the leadership of the Greek resistance movement. In the second phase (1944), the ascendant communists, in military control of most of Greece, confronted the returning Greek government in exile, which had been formed under the auspices of the Western Allies in Cairo and originally included six KKE-affiliated ministers. In the third phase (commonly called the "Third Round" by the communists), guerrilla forces controlled by the KKE fought against the internationally recognized Greek government which was formed after elections were boycotted by the KKE. Although the involvement of the KKE in the uprisings was universally known, the party remained legal until 1948, continuing to coordinate attacks from its Athens offices until proscription. The war, which lasted from 1946 to 1949, was characterised by guerilla warfare between the KKE forces and Greek governmental forces mainly in the mountain ranges of northern Greece. The war ended with the NATO bombing of Mount Grammos and the final defeat of the KKE forces. The civil war left Greece with a legacy of political polarization. As a result, Greece also entered into an alliance with the United States and joined NATO, while relationships with its Communist northern neighbours, both pro-Soviet and neutral, became strained. In the 1950s and 1960s, Greece developed rapidly, initially with the help of the Marshall Plan's grants and loans, also to decrease the communist influence. In 1952, by joining NATO, Greece clearly became part of the Western Bloc of the Cold War. But in Greek society, the deep divide between the leftist and rightist sections continued. Greece economy advanced further through growth in the tourism sector. New attention was given to women's rights, and in 1952 suffrage for women was guaranteed in the Constitution, full Constitutional equality following, and Lina Tsaldari becoming the first female minister that decade. In 1967, the Greek military seized power in a coup d'état, overthrowing the centre right government of Panagiotis Kanellopoulos. It established the Greek military junta of 1967-1974 which became known as the Régime of the Colonels. The junta government's accession to power lead to an isolation to Greece from European affairs and froze Greece's entry to the European Union. In 1973, the régime abolished the Greek monarchy and in 1974, dictator Papadopoulos denied help to the United States. After a second coup that year, Colonel Ioannides was appointed as the new head-of-state. Ioannides was responsible for the 1974 coup against President Makarios of Cyprus. The coup became the pretext for the first wave of the Turkish invasion of Cyprus in 1974 (see Greco-Turkish relations). The Cyprus events and the outcry following a bloody suppression of Athens Polytechnic uprising in Athens led to the implosion of the military régime. After the end of the military régime, democracy was restored. The fall of the junta was followed by the metapolitefsi. Metapolitefsi was initiated when Konstantinos Karamanlis returned from self-exile in Paris at the invitation of the junta, to become interim prime minister on July 23, 1974. and later gained re-election for two further terms at the head of the conservative New Democracy Party. In August 1974, Greek forces withdrew from the integrated military structure of NATO in protest at the Turkish occupation of northern Cyprus. In 1974, a referendum voted 69%–31% to confirm the deposition of King Constantine II. A democratic republican constitution came into force. Another previously exiled politician, Andreas Papandreou also returned and founded the socialist PASOK Party (Panhellenic Socialist Movement), which won the 1981 election and dominated Greek politics for almost two decades. After the restoration of democracy, Greece's stability and economic prosperity improved significantly. Greece rejoined NATO in 1980, joined the European Union (EU) in 1981 and adopted the euro as its currency in 2001. New infrastructure funds from the EU and growing revenues from tourism, shipping, services, light industry and the telecommunications industry have brought Greeks an unprecedented standard of living. Tensions continue to exist between Greece and Turkey over Cyprus and the delimitation of borders in the Aegean Sea but relations have considerably thawed following successive earthquakes, first in Turkey and then in Greece, and an outpouring of sympathy and generous assistance by ordinary Greeks and Turks (see Earthquake Diplomacy). The 2008 global economic recession impacted Greece, as well as the rest of the countries in the eurozone. From late 2009, fears developed in investment markets of a sovereign debt crisis concerning Greece's ability to pay its debts, in view of the large increase in the country's government debt. This crisis of confidence was indicated by a widening of bond yield spreads and risk insurance on credit default swaps compared to other countries, most importantly Germany. Downgrading of Greek government debt to junk bond status created alarm in financial markets. On 2 May 2010, the Eurozone countries and the International Monetary Fund agreed on a €110 billion loan for Greece, conditional on the implementation of harsh austerity measures. In October 2011, Eurozone leaders also agreed on a proposal to write off 50% of Greek debt owed to private creditors, increasing the European Financial Stability Facility amount to about €1 trillion, and requiring European banks to achieve 9% capitalization to reduce the risk of contagion to other countries. These austerity measures were extremely unpopular with the Greek public, precipitating demonstrations and civil unrest. ^ Georgiev 1981, pp. 156, 192. ^ Pashou, Drineas & Yannaki 2014, p. 5: "The earliest Neolithic sites with developed agricultural economies in Europe dated 8500–9000 BPE are found in Greece. The general features of material culture of the Greek Neolithic and the genetic features of the preserved crops and associated weeds of the earliest Greek Neolithic sites point to Near Eastern origins. How these Near Eastern migrants reached Greece is a matter of speculation...Our data support the Anatolian rather than the Levantine route because they consistently show the Aegean islands to be connected to the Near East through Anatolia. Archaeological evidence from Greek and Near Eastern and Anatolian Neolithic sites suggests that multiple waves of Neolithic migrants reached Greece and Southern Europe. Most likely multiple routes were used in these migrations but, as our data show, the maritime route and island hopping was prominent." ^ Coleman 2000, pp. 101–153. ^ Pullen 2008, p. 20; van Andels & Runnels 1988, "The transition to the Early Bronze Age", pp. 238–240; French 1973, p. 53. ^ Pullen 2008, p. 36; Forsén 1992, pp. 251–257. ^ a b c d e Waldman & Mason 2006, "Minoans", pp. 521–526. ^ Castleden 1993, pp. 1–2; Waldman & Mason 2006, "Minoans", pp. 521–526. ^ Dickinson 1977, pp. 32, 53, 107–108; Dickinson 1999, pp. 97–107. ^ Hall 2014, 3: The End of the Mycenaean World and Its Aftermath (The Loss and Recovery of Writing). ^ Sealey 1976, pp. 10–11. ^ Olbrycht 2011, pp. 343. ^ Rhodes 2007, p. 3. ^ Winnifrith & Murray 1983, p. 113: "For August Heisenberg the Byzantine empire was 'the Christianised Roman empire of the Greek nation'." ^ Heisenberg, Kromayer & von Wilamowitz-Moellendorff 1923, "Staat und Gesellschaft des Byzantinischen Reiches", p. 364: "Byzanz ist das christlich gewordene Römerreich griechischer Nation." ^ Vacalopoulos 1976, p. 45: "The Greeks never lost their desire to escape from the heavy hand of the Turks, bad government, the impressment of their children, the increasingly heavy taxation, and the sundry caprices of the conqueror. Indeed, anyone studying the last two centuries of Byzantine rule cannot help being struck by the propensity of the Greeks to flee misfortune. The routes they chiefly took were: first, to the predominantly Greek territories, which were either still free or Frankish-controlled (that is to say, the Venetian fortresses in the Despotate of Morea, as well as in the Aegean and Ionian Islands) or else to Italy and the West generally; second, to remote mountain districts in the interior where the conqueror's yoke was not yet felt." ^ Myrsiades & Myrsiades 1992, pp. 32–33. ^ Birēs & Kardamitsē-Adamē 2004, p. 173. ^ a b c d e Clogg 2002, pp. 86–98. ^ Jones 2010, pp. 150–151: "By the beginning of the First World War, a majority of the region’s ethnic Greeks still lived in present-day Turkey, mostly in Thrace (the only remaining Ottoman territory in Europe, abutting the Greek border), and along the Aegean and Black Sea coasts. They would be targeted both prior to and alongside the Armenians of Anatolia and Assyrians of Anatolia and Mesopotamia...The major populations of "Anatolian Greeks" include those along the Aegean coast and in Cappadocia (central Anatolia), but not the Greeks of the Thrace region west of the Bosphorus...A "Christian genocide" framing acknowledges the historic claims of Assyrian and Greek peoples, and the movements now stirring for recognition and restitution among Greek and Assyrian diasporas. It also brings to light the quite staggering cumulative death toll among the various Christian groups targeted...of the 1.5 million Greeks of Asia minor – Ionians, Pontians, and Cappadocians – approximately 750,000 were massacred and 750,000 exiled. Pontian deaths alone totaled 353,000." ^ Jones 2010, p. 166: "An estimate of the Pontian Greek death toll at all stages of the anti-Christian genocide is about 350,000; for all the Greeks of the Ottoman realm taken together, the toll surely exceeded half a million, and may approach the 900,000 killed that a team of US researchers found in the early postwar period. Most surviving Greeks were expelled to Greece as part of the tumultuous "population exchanges" that set the seal on a heavily "Turkified" state." ^ Jones 2010, pp. 171–172. ^ Schaller & Zimmerer 2008, pp. 7–14. ^ "Genocide Resolution approved by Swedish Parliament — full text". Armenia News – News.am. 15 March 2010. Retrieved 18 July 2014. ^ Churchill 2010, p. 285. ^ Goulter 2014, pp. 1023–1025. ^ Shrader 1999, p. 266: "As the first major confrontation of the Cold War, the Greek civil war was a testing ground for the tactics and techniques of insurgent-counterinsurgent warfare, which would mark military affairs for the ensuing four decades." ^ Marantzidis & Antoniou 2004, pp. 223–231. ^ Clogg 2002, p. 159. ^ Bahcheli, Bartmann & Srebrnik 2004, p. 167. ^ "NATO Update 1974". North Atlantic Treaty Organization. 26 October 2001. ^ Moustakis 2003, p. 33. ^ Featherstone 1990, p. 182. ^ Coccossis & Psycharis 2008, pp. 44–45 (including "Table 1: Periods of the Post-dictatorial Greek Governments"). ^ Matlock, George (16 February 2010). "Peripheral euro zone government bond spreads widen". Reuters. Retrieved 19 July 2014. ^ "Acropolis now". The Economist. 29 April 2010. Retrieved 19 July 2014. ^ Matlock, George (28 April 2010). "Greek/German bond yield spread more than 1,000 bps". Reuters. Retrieved 19 July 2014. ^ Oakley, David; Hope, Kerin (18 February 2010). "Gilt yields rise amid UK debt concerns". Financial Times. Retrieved 19 July 2014. Bahcheli, Tozun; Bartmann, Barry; Srebrnik, Henry (2004). De Facto States: The Quest For Sovereignty. London: Routledge (Taylor & Francis). ISBN 978-0-20-348576-7. Birēs, Manos G.; Kardamitsē-Adamē, Marō (2004). Neoclassical Architecture in Greece. Los Angeles, CA: Getty Publications. ISBN 9780892367757. Caskey, John L. (July–September 1960). "The Early Helladic Period in the Argolid". Hesperia. 29 (3): 285–303. doi:10.2307/147199. JSTOR 147199. Caskey, John L. (1968). "Lerna in the Early Bronze Age". American Journal of Archaeology. 72 (4): 313–316. doi:10.2307/503823. JSTOR 503823. Castleden, Rodney (1993) . Minoans: Life in Bronze Age Crete. London and New York: Routledge. ISBN 978-1-13-488064-5. Chadwick, John (1963). The Cambridge Ancient History: The Prehistory of the Greek Language. Cambridge: Cambridge University Press. Churchill, Winston S. (2010) . Triumph and Tragedy: The Second World War (Volume 6). New York: RosettaBooks, LLC. ISBN 978-0-79-531147-5. Clogg, Richard (2002) . A Concise History of Greece (Second Edition). Cambridge and New York: Cambridge University Press. ISBN 978-0-52-100479-4. Coccossis, Harry; Psycharis, Yannis (2008). Regional Analysis and Policy: The Greek Experience. Heidelberg: Physica-Verlag (A Springer Company). ISBN 978-3-79-082086-7. Coleman, John E. (2000). "An Archaeological Scenario for the "Coming of the Greeks" ca. 3200 B.C." The Journal of Indo-European Studies. 28 (1–2): 101–153. Featherstone, Kevin (1990). "8. Political Parties and Democratic Consolidation in Greece". In Pridham, Geoffrey. Securing Democracy: Political Parties and Democratic Consolidation in Southern Europe. London: Routledge. pp. 179–202. French, D.M. (1973). "Migrations and 'Minyan' pottery in western Anatolia and the Aegean". In Crossland, R.A.; Birchall, Ann. Bronze Age Migrations in the Aegean. Park Ridge, NJ: Noyes Press. pp. 51–57. Goulter, Christina J. M. (2014). "The Greek Civil War: A National Army's Counter-insurgency Triumph". The Journal of Military History. 78 (3): 1017–1055. Jones, Adam (2010). Genocide: A Comprehensive Introduction. London and New York: Routledge (Taylor & Francis). ISBN 978-0-20-384696-4. Marantzidis, Nikos; Antoniou, Giorgios (2004). "The Axis Occupation and Civil War: Changing Trends in Greek Historiography, 1941–2002". Journal of Peace Research. 41 (2): 223–241. doi:10.1177/0022343304041779. Moustakis, Fotos (2003). The Greek-Turkish Relationship and NATO. London and Portland: Frank Cass. ISBN 978-0-20-300966-6. Myrsiades, Linda S.; Myrsiades, Kostas (1992). Karagiozis: Culture & Comedy in Greek Puppet Theater. Lexington, KY: University Press of Kentucky. Olbrycht, Marek Jan (2011). "17. Macedonia and Persia". In Roisman, Joseph; Worthington, Ian. A Companion to Ancient Macedonia. John Wiley & Sons. pp. 342–370. ISBN 978-1-4443-5163-7. Pullen, Daniel (2008). "The Early Bronze Age in Greece". In Shelmerdine, Cynthia W. The Cambridge Companion to the Aegean Bronze Age. Cambridge and New York: Cambridge University Press. pp. 19–46. ISBN 978-0-521-81444-7. Pashou, Peristera; Drineas, Petros; Yannaki, Evangelia (2014). "Maritime Route of Colonization of Europe". Proceedings of the National Academy of Sciences of the United States of America. 111 (25): 9211–9216. doi:10.1073/pnas.1320811111. PMC 4078858. PMID 24927591. Rhodes, P.J. (2007) . The Greek City-States: A Source Book (2nd ed.). Cambridge: Cambridge University Press. ISBN 978-1-13-946212-9. Schaller, Dominik J.; Zimmerer, Jürgen (2008). "Late Ottoman Genocides: The Dissolution of the Ottoman Empire and Young Turkish Population and Extermination Policies – Introduction". Journal of Genocide Research. 10 (1): 7–14. doi:10.1080/14623520801950820. Sealey, Raphael (1976). A History of the Greek City-States, ca. 700–338 B.C. Berkeley and Los Angeles: University of California Press. ISBN 978-0-631-22667-3. Shrader, Charles R. (1999). The Withered Vine: Logistics and the Communist Insurgency in Greece, 1945–1949. Westport, CT: Greenwood Publishing Group, Inc. ISBN 978-0-27-596544-0. Vacalopoulos, Apostolis (1976). The Greek Nation, 1453–1669. New Brunswick, NJ: Rutgers University Press. ISBN 9780813508108.
van Andels, Tjeerd H.; Runnels, Curtis N. (1988). "An Essay on the 'Emergence of Civilization' in the Aegean World". Antiquity. 62 (235): 234–247. doi:10.1017/s0003598x00073968. Archived from the original on 2013-10-14. Waldman, Carl; Mason, Catherine (2006). Encyclopedia of European Peoples. New York, NY: Infobase Publishing (Facts on File, Inc.). ISBN 978-1-43-812918-1. Boardman, John; Griffin, Jasper; Murray, Oswyn (1991) . The Oxford History of Greece & the Hellenistic World. Oxford and New York: Oxford University Press. ISBN 978-0-19-285247-2. Burn, Andrew Robert (1990). The Penguin History of Greece. Harmondsworth: Penguin Books. ISBN 978-0-14-013751-4. Cartledge, Paul (2002). The Cambridge Illustrated History of Ancient Greece. Cambridge: Cambridge University Press. ISBN 978-0-52-152100-0. Demand, Nancy H. (2006). A History of Ancient Greece in Its Mediterranean Context. Cornwall-on-Hudson, NY: Sloan Publishing. ISBN 978-1-59-738003-4. Grant, Michael (1992). A Social History of Greece and Rome. New York: Scribner (Maxwell Macmillan International). ISBN 978-0-68-419309-0. Koliopoulos, John S.; Veremis, Thanos M. (2010). Modern Greece: A History since 1821. Chichester and Malden: John Wile & Sons. ISBN 978-1-44-431483-0. Latacz, Joachim (1994). "Between Troy and Homer. The So-Called Dark Ages in Greece". Storia, Poesia e Pensiero nel Mondo Antico. Studi in Onore di Marcello Gigante. Naples: Bibliopolis. ISBN 978-8-87-088285-8. Maran, Joseph (1998). Kulturwandel auf dem griechischen Festland und den Kykladen im späten 3. Jahrtausend v. Chr (in German). Bonn: Habelt. ISBN 978-3-77-492870-1. Podzuweit, Christian (1982). "Die mykenische Welt und Troja". In Hänsel, B. Südosteuropa zwischen 1600 und 1000 v. Chr (in German). Berlin: Prahistorische Archäologie in Sudosteuropa. pp. 65–88. Pomeroy, Sarah B.; Burstein, Stanley M.; Donlan, Walter; Roberts, Jennifer Tolbert (2009). A Brief History of Ancient Greece: Politics, Society and Culture. New York and Oxford: Oxford University Press. ISBN 978-0-19-537235-9. Taylour, Lord William (1990) . The Mycenaeans. London: Thames & Hudson, Limited. ISBN 978-0-50-027586-3. Woodhouse, Christopher Montague (1991). Modern Greece: A Short History. London and Boston: Faber and Faber. ISBN 978-0-57-116122-5. Wikimedia Commons has media related to History of Greece.